The rustic barn-door rail system is easy to install and caters easily to most applications. The frosted glass panel door allows the light in, and still provides privacy. The rustic barn-door rail system was installed in such manner as to allow for casings and baseboards to remain, to keep with the trim in the rest of the house. The stainless-steel rod track system is more streamlined, but the installation process is slightly more difficult. In this custom application, two systems merge to cater to the French doors. 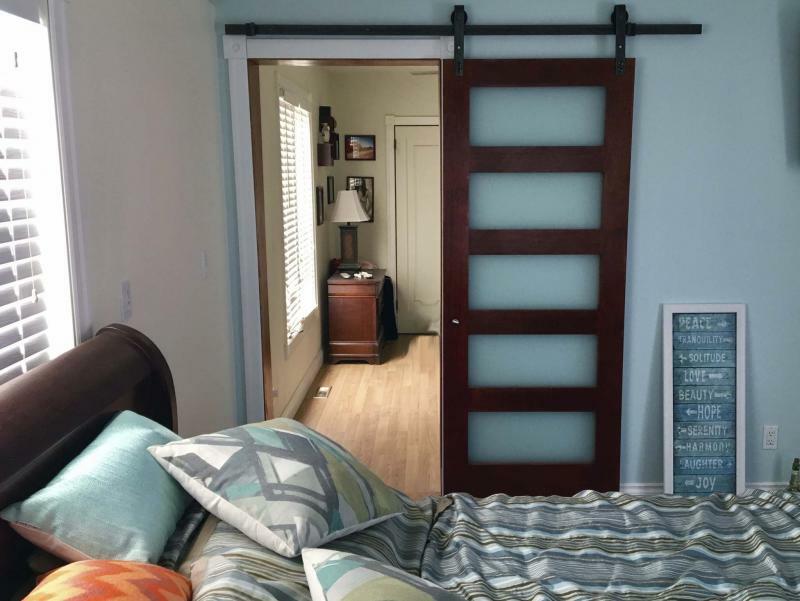 Barn doors have been trending lately, as an entryway alternative to the traditional door and jamb. Barn doors are available in many styles and options; even an old hinged door can be converted with a few slight modifications. 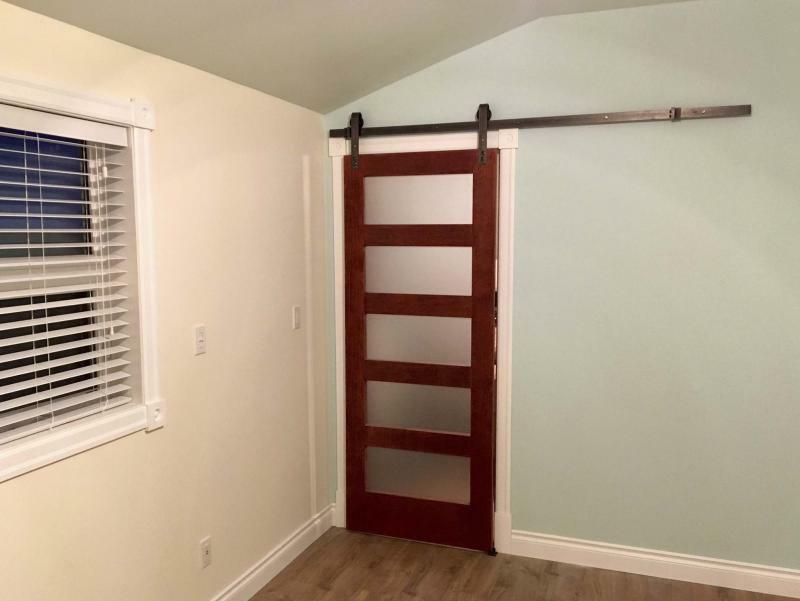 Although the principal idea of a barn door is the track on which it slides, the track or rail system can vary, and it is a good idea to know which best suits your needs. The most common barn-door track is the sliding door rail system. Essentially, two side-mounted brackets with rollers above the top of the door rest atop a rail, which is fastened to the wall above and to one side of the entryway. Stops at each end of the rail prevent the rollers from rolling past the edge of the rail, and can be adjusted to refine how the door rests when in the open or closed position. The brackets are bolted vertically in two places, on each side of the door panel to prevent the brackets from shifting when hitting the stops at either end of the rail. In some cases, a safety bolt can be installed just below the rail along each bracket to also prevent the rollers from hopping off the rail. Esthetically, each system has its own charm, but they all generally function the same way. In my master bedroom expansion, the entryway from the old bedroom (which is now the walk-through closet) lends itself to a sliding barn door, as the doorway is at the end of a long wall. The rustic look of the sliding door rail system suits my decor, and a frosted glass door panel was chosen because it allows light in, while still providing enough privacy from room to room. If it is a more refined look you seek, another common barn-door track design is the stainless-steel rod system. This is what was chosen for my dual French door sliders into my step-down dining room area. The brackets and track are less obtrusive, and the stainless steel is a clean and more contemporary look. 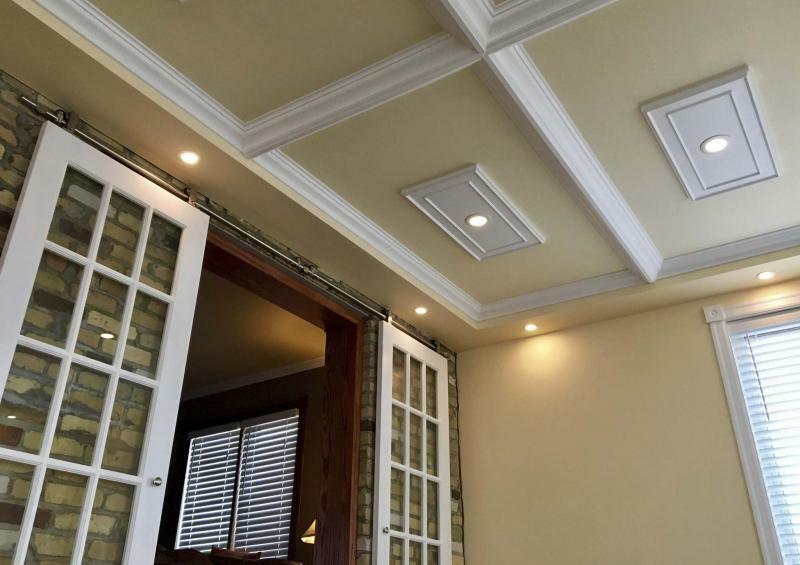 This system seems to also require less height above the door to install, which was a concern of mine in the step-down dining room due to the lower perimeter boxing with LED pot lights that surround the quadrants trimmed with crown moulding. The installation of this track system was not, however, as straightforward as the rustic rail. The brackets with rollers for the stainless steel system are top-mounting brackets, along the top edge of the door panel (in my case, traditional French doors with glass panes throughout). The bracket installation requires that bolt anchors first be affixed within the top of the door panel, before the brackets can then be bolted to the top of the door — it soon became apparent that the amount of precision required to drill the holes for these anchors, so that they’d all line up with the pre-drilled holes in each roller bracket, was beyond the capabilities of a hand-held drill. After spending a couple of hours making a good attempt at following the instructions, I abandoned the process and used 2½-inch TimberLok lag screws in lieu of the bolts. With the roller brackets attached to the top of each of the door panels, it was time to secure the stainless rod(s) to the wall. Because my custom application morphed two pairs of systems for each set of French doors, the brackets and rods were affixed in such a way as to accommodate my needs. Regardless, the rods are secured to the wall in the same manner — two main wall brackets, one at either end of each rod, hold the track in place while partial brackets lend support along the underside of the rod between each main wall bracket. The roller brackets sit atop the rod, and adjustable stops are positioned to allow the door to stop where desired when the door is fully opened or closed. My French door application offers two door panels that close against each other, which can quickly reveal slight discrepancies if both doors are closely level and square. Luckily, the lag screws I used to anchor the roller brackets atop of the panel also allowed me to loosen and shim each bracket to adjust how the two doors rested next to each other when they are both closed. Although the look of the stainless-steel track system in conducive to the overall feel of the newly constructed space, the rustic sliding door rail system was much easier to install. The most important facet of the sliding door track installation process is whether the rail is set perfectly to level. In the step-down dining room instances, the tracks were affixed to a brick wall, as near to level as possible — all four doors can be opened slightly, and the doors do not roll without further human intervention. For the bedroom application, the rail was installed slightly off-level so that the door "wants" to slowly roll open. Unless the bedroom is being used, it’s nice to have the door open. To keep it closed, an ever-so-slight notch was created with a grinder to allow the roller on that side of the door to dip into the notch when fully closed — a custom step that suits my needs in this instance. After having installed several of these barn-door track systems for clients, I’ve found that using a small piece of clear tape on the top of the rail can achieve the same result. All depends on how you want the door to behave.